It is impossible to summarize the achievements of Dr. Ambedkar in just a few sentences but still we will try. First and foremost, it is Dr. Ambedkar’s personal revolution that has had the greatest impact on society. His personal revolution comprised an educational revolution in which a Dalit scaled the educational heights of his time. It also comprised a character revolution, revealed in a life of endless struggle and endless literary and social activism. 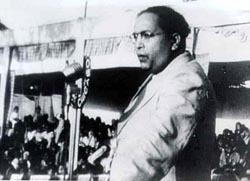 Above all it was a character revolution, revealed in Ambedkar’s commitment to rational discourse rather ranting like his upper-caste enemies, it was a commitment to debating issues rather than in engaging in slanderous attacks and abuse, it was a commitment to maintaining his composure under fire while his opponents were losing theirs. Ambedkar launched a multidimensional ideological revolution. For less educated readers, Ambedkar wrote simple but incisive articles in beautiful Marathi (included in the Sahitya Academy’s Masterpieces of Indian Literature) that built on the foundations of the Maratha humanism of Namdev and allowed his rural readers to enter into modern discussions of sociology and economics. In addition Dr Ambedkar was able to develop the most powerful critique of casteism in Indian history. If Ambedkar were alive today, he would not be re-reading his old books; he would be writing new ones based on the latest historical discoveries. Just as Marx transcended Marxism, so also Ambedkar transcended Ambedkarism. Ambedkar was the first Indian thinker to create the mandate for the annihilation of casteism. He was the first Dalit who was a national leader, who was able to win an election in Khulna District of Bengal province with the help of Jogendranath Mandal, even though he was not a Bengali. This in itself was a social revolution, as it showed that fighting casteism was a national issue that transcended language and birthplace. Ambedkar created a legal revolution by positing that the very purpose of any constitution is to guarantee equality of dignity. When he realized that, contrary to his American teachers, constitutional rights do not bring about social equality, he began to create a national movement to force social change before his untimely death. For most of his life, Dr. Ambedkar was anti-religious, as per the teachings of John Dewey, but he realized that Indian society mandated some form of spiritual struggle. Though he had so many degrees, he did not have the spiritual revolutionary bha’va (ethos) of Chokhamela or the capacity to create a socio-spiritual or cultural movement like Ravidas, since it is not part of the heritage of Western education. Hence, he was forced to choose amongst the different religions. He was trying to create a new Buddhism before his untimely demise. This social evolutionary movement still has impact on Indian society today. Because Ambedkar lived, we have the annihilation of casteism as the desideratum of India today – to move from inhuman apartheid towards a genuinely human and humane society. Ambedkar’s legacy keeps our eyes focused on the prize of a casteless society despite the miserable legacy of savarna svaraja of 1947. Indian Caste system is more dangerous and harmful than chemical weapons. It (Indian Caste system) is a great challenge and threat to unity and peace and to global society. It (Indian Caste system) divides the society. If you want to save your country, state, society and civilized society, annihilate the Indian Caste system. Indian Caste system is more dangerous, violent, cruel and hard than any other kind of racial discrimination or slavery system.